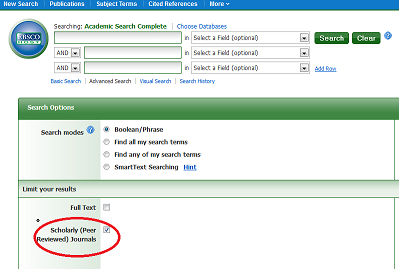 A peer-reviewed article (also called a Scholarly article) is a paper that has been reviewed by experts in that subject. This ensures that the material is of the highest quality. When using databases, the best way to ensure that your results are peer-reviewed or scholarly is to select that option in the field limiters or result limiters. These are most often found in the "Advanced Search" form.